Wonders of coconut oil & the best recipe ever! We all are familiar with coconut oil. We all know that it is good for our hair, skin etc.. But have you tried cooking or baking with it? Baking with coconut oil is something new to me. Studies are now finding it has great health benefits and is a wonderful substitute for other oils in your cooking and baking. Coconut oil is one of the healthiest fats available. The main type of saturated fat found in coconut oil is lauric acid. Preliminary studies show that lauric acid increases the levels of HDL in the body and lowers LDL. Virgin coconut oil doesn’t contain hydrogenated oils or harmful trans fats so it’s a healthier option. Coconut oil is incredibly heat stable when compared to other typical baking oils and fats such as butter, olive oil, and even vegetable oil. Unlike butter, coconut oil is shelf stable and does not require refrigeration. Coconut oil also does not go rancid quickly and can be stored for over a year on the shelf. A good substitute for butter in vegan baking. In liquid form, coconut oil is an excellent substitute for vegetable oil, melted butter or margarine. One cup of solid coconut oil will melt to approximately one cup of liquid. You can substitute for butter in 1:1 ratio. You can either microwave or heat on a stove top to melt the solidified coconut oil. It is advisable to use coconut oil, in liquid form at room temperature. What type of coconut oil to use? Virgin (unrefined coconut oil or pure) or the less processed oil, preferably organic is the best. The virgin oil is minimally processed using very little heat and has a mild coconut scent and flavor. Coconut oil helps to curb the salt content, which is otherwise found in salted butter. I find that when I bake with it, my bakes have a special lightness to them and a slightly sweet fragrance unique to coconut oil. I love to incorporate coconut oil into my weekly baking because it makes sweet treats a little healthier. Add some whole wheat flour and natural sweetener, and you have a nourishing, real food. I even use coconut oil in baking my breads! 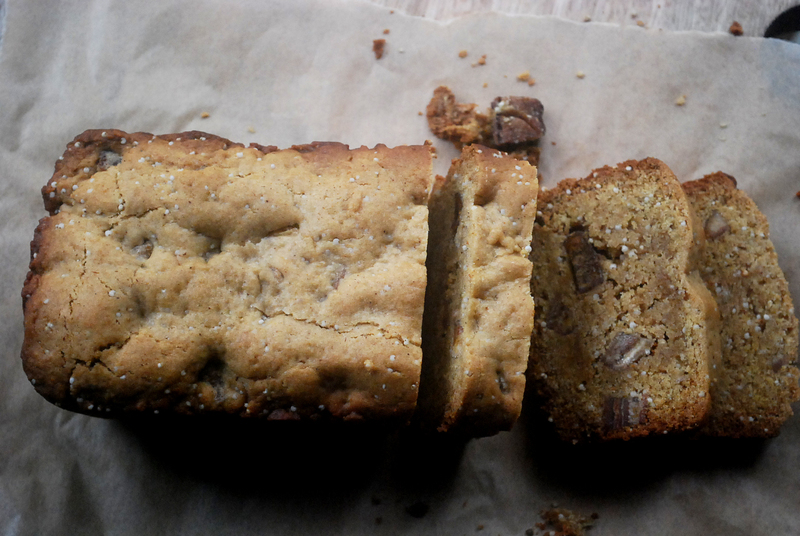 I’ve shared my banana bread recipe before but this one is different. Way different! 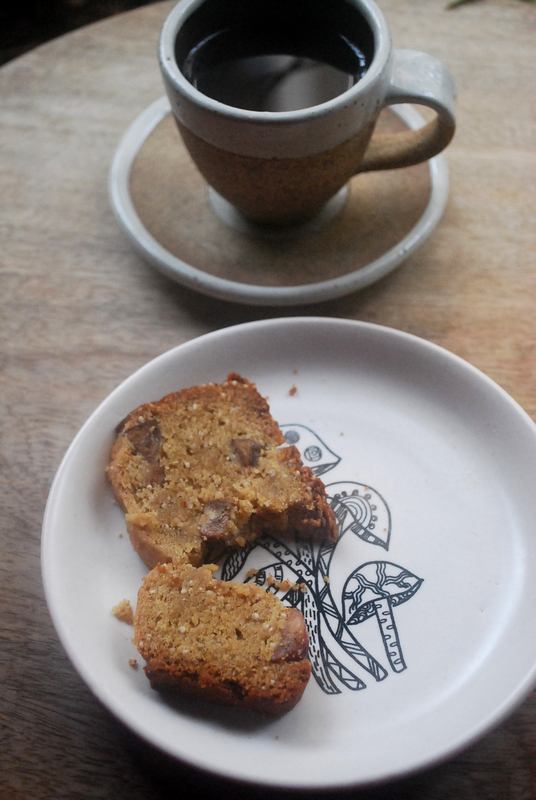 Everyday I’ve been having a slice with my morning & evening cup of coffee. Every bite takes you to heaven. Trust me. 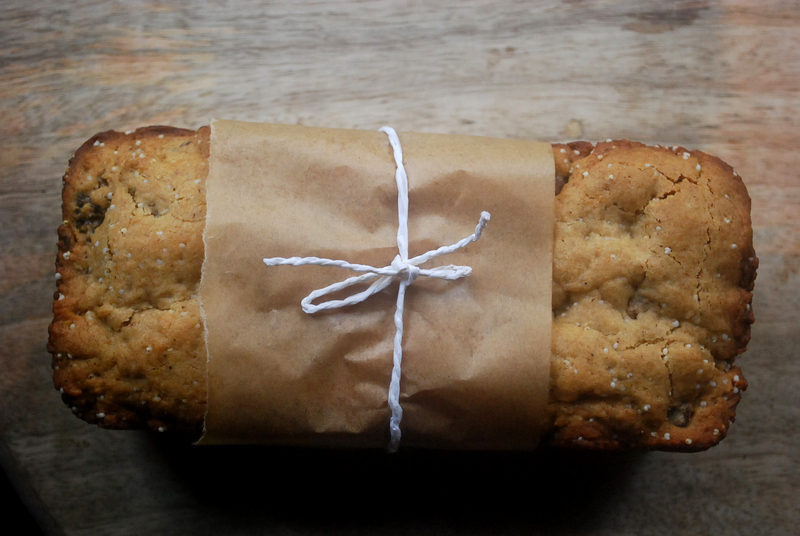 The traditional banana bread is made by using mashed and over ripe bananas. Here we are using sun dried bananas. I discovered these from Sirsi, Karnataka. You can also substitute the dried bananas to dried figs. I like my organic figs from Ecorico . The millet inspiration is from Smitten Kitchen. Preheat the oven at 160 degree centigrade and grease a 8 by 4 inch loaf pan or equivalent. Sieve the flour along with baking soda, salt and cinnamon powder. Add egg, raw sugar and beat until mixed well. Add coconut oil and mix. Combine the dry and wet ingredients gently and mix it with the help of a spatula. Pour the mixture into the greased pan and bake for about 45 minutes or until its done based on your oven settings. Allow it to cool on a wire rack for about one hour. You can store this bread at room temperature for 3 days or refrigerate up to 10 days. Most of the ingredients used in making this bread is from i2cook.com. 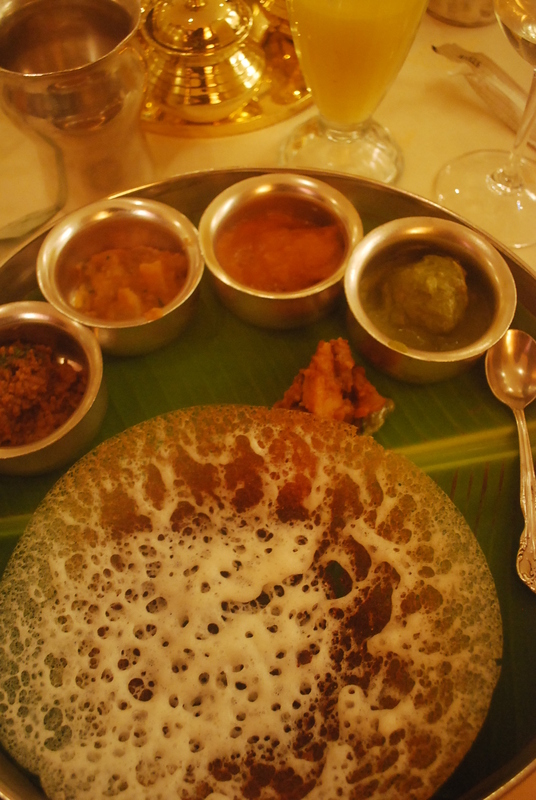 I was recently invited to Dakshin, ITC Maratha and without a second thought, I grabbed the opportunity to go and explore one of my favourite cuisine. Franco-Pondicherry or Pondicherry cuisine, has been union territory’s best-kept secret. The flavors are mild and the fusion between the French and Podicherry is what makes this cuisine unique and different from rest of India. Meat or fish is sauteed with dry spices and ghee is often used in the cooking. Tomatoes are sparingly used and coconut milk is the base for most dishes. Though seafood is found in abundance, the locals prefer to cook with beef or mutton during festive seasons. Eggplant, drumsticks and mangoes (when in season) are used for vegetarian dishes or mixed with meat and cooked together. 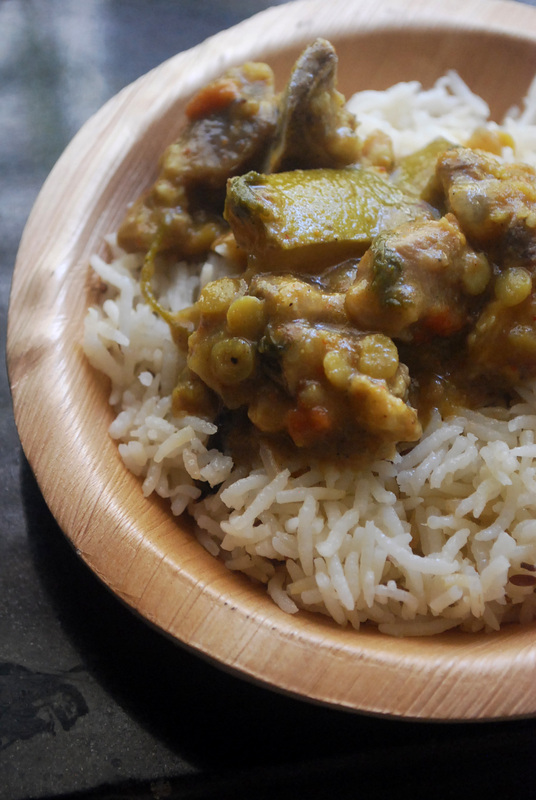 Markandam Dalcha (lamb blanquette dalcha) is one such example, recipe from the book “The Pondicherry Kitchen” by Lourdes Tirouvanziam-Louis. Creamy dalcha is a combination of lamb, dal & mango. The Pondicherry Kitchen is a cookbook which showcases the true authencity of Pondicherry cuisine. I’ve tried 4 different recipes for one of our monthly dinners at Coral from appetizer to dessert. The author’s few notes before the recipe displays some of the best kept secrets of Pondicherry cooking. Each recipe is unique and more profound than the other. What I also noticed at Franco-Pondicherry fest at Dakshin was that the gravies were treated more like sauces and were much thicker than other Indian gravies. My personal favourite was chicken curry with coriander and mint (kothamalli puthina kozhi kari). In traditional Tamil cooking, tamarind is used as a souring agent but in Pondicherry cusine you will see a distinct taste of vinegar used in their gravies too. Raw mangoes are used in gravies and chutneys for sourness. 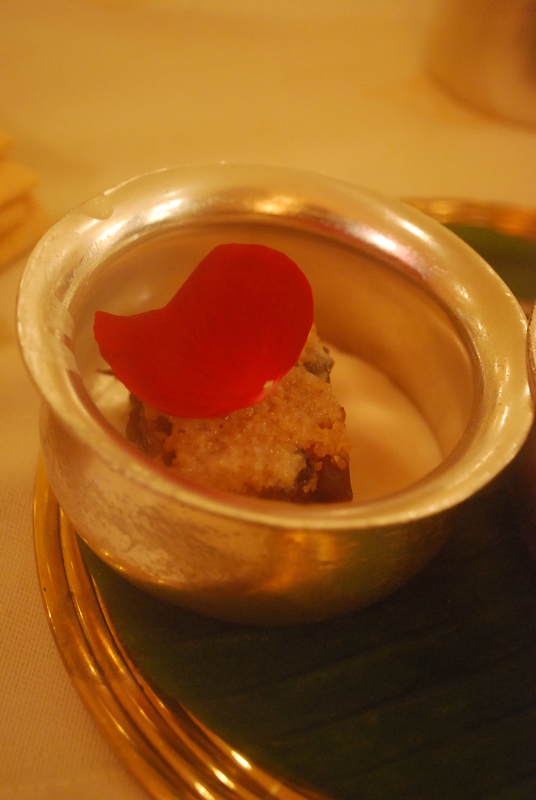 Desserts served were semolina cake with rose petal basundi and baguette with basundi. Basundi is traditionally made with thick milk but, this particular one was made with coconut milk – mild, light and delicious. 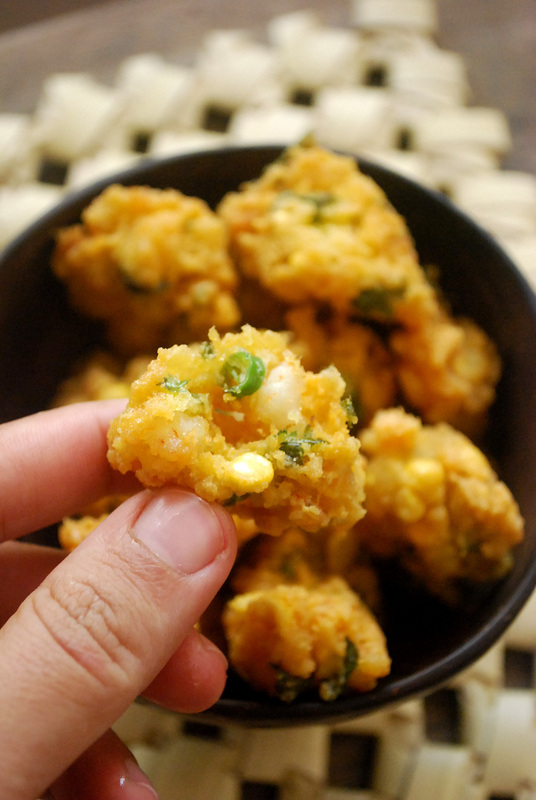 I would like to share a recipe of one of my favourite appertizer from the cookbook – Erral Masala Vadai (prawn & channa dal fritter). It is an ideal snack for the monsoons and very easy to make. Soak channa dal in water for 2 hours. Drain and coarsely grind. Mix the channa dal with all of the above ingredients, except for oil. Heat oil in a wok. Shape the ingredients into a ball, flatten a bit. Deep fry until golden brown on medium flame. Serve hot with some chutney or sauce. 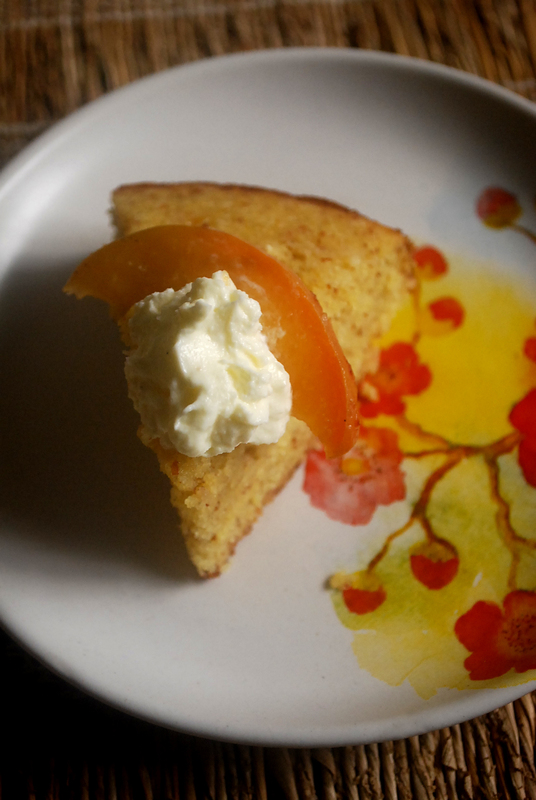 Polenta is a new ingredient that I have been exploring in different ways, a cake is what I came up with; different isnt it? It is also a gluten free ingredient. Gluten is a protein found in many grains like wheat, bulgur (dalia), couscous, oats etc. A lot of people these days are either being diagnosed as gluten intolerant or choose to go on a gluten free diet for various reasons. What I realized was that polenta is a great ingredient to work with! From savory to sweet, it knows how exactly to blend in with its fellow ingredients. Polenta is also a great substitute for mashed potatoes or you could also serve them as a side in your steaks or bakes. 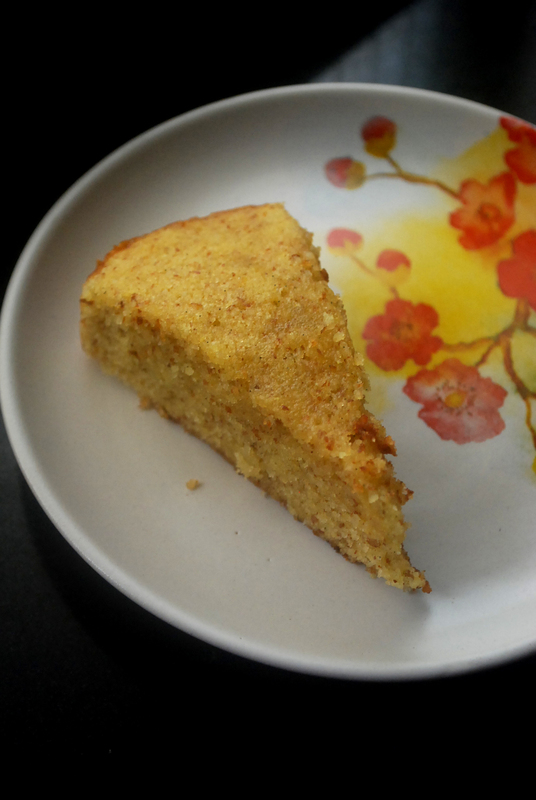 Polenta cake has a nice moist, grainy and crumbly texture. The minute I saw the finished cake, I knew it has to be good! 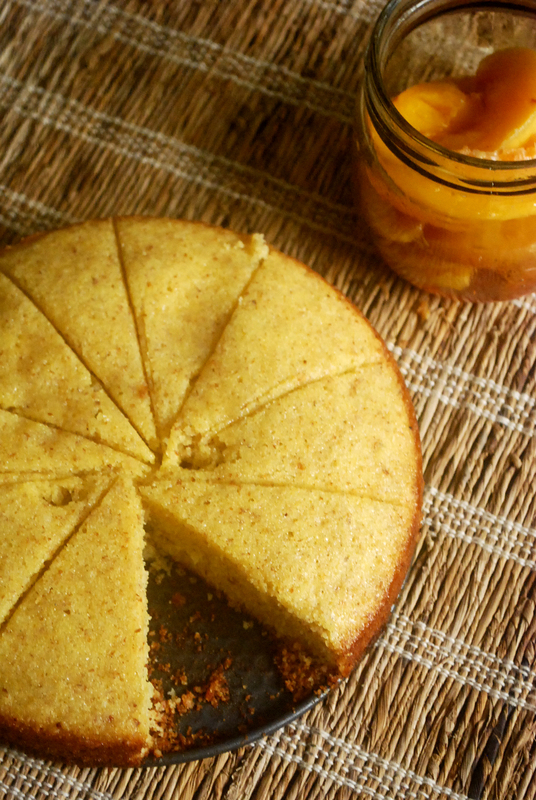 This cake can be served with your tea/coffee or as a dessert. I recently had some guests at home and served it with some poached peaches, infused with vanilla. You could also use mixed poached fruits to give it a nice colorful and fruitful appeal. I also served mine with some cream cheese. However, my friends on the second serving suggested that ice-cream would be a really good option. Sieve polenta and baking powder in a bowl. Add almond meal and mix. Keep this dry mix aside. Mix the butter and sugar in a separate bowl. Add eggs and mix until creamy in texture. Add vanilla and dry mix to this wet mixture. Mix until combined. Do not mix vigorously. Put this mixture in a round cake pan and bake at 180 degree centigrade in a pre heated oven for about 25 minutes or depending on your oven settings. Test the cake by inserting a tooth pick and checking if the center is cooked. Cool on a wire rack for at two hours and serve warm or cold with ice-cream or some poached fruits. I’ve noticed that the cake tastes much better the next day or on a third day. You can store this cake at room temperature for 3 days in cold weather condition. Ingredients like polenta & raw sugar are available at i2cook.com. I was gifted this brilliant cook book last year by my close family members. A simple, yet well explained book on the inside of elBulli’s staff meals. Ferran Adria (head chef) explains that staff members are like a family, and the family meal is an important moment when everyone sits down together to eat. Hence he named the book, “the family meal”. Its amazing how the entire month’s meal was planned, documented and cooked for 75 people! The family meal is a book which is not like a regular cookbook. An everyday meal with three course meal from mains to simple desserts recipes can be adapted very easily for home cooking. A step by step instructions with pictures and ingredient measurements for serving 2 to 75 people. The meals are designed keeping in mind the availability and not making the meals too expensive. A detailed explanation about planning your meal for restaurant staff or your family at home is sure a great book to refer to. 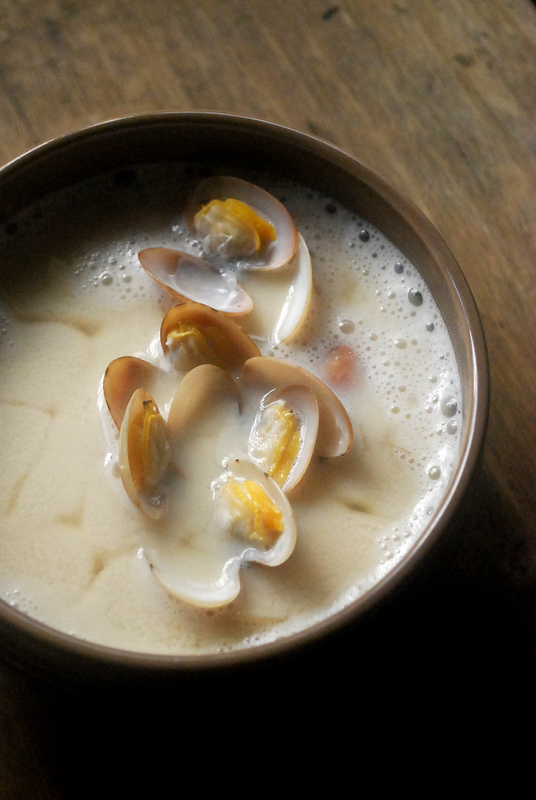 The day, when I saw the clams at my local fish market, I knew exactly what I’m going to make. A very easy recipe with just 3 ingredients. The original recipe asks for dashi powder. I had to negate it since I couldn’t source any. However, I still like the taste of this soup and it is very different from the regular soups that I’ve ever had! I have used locally made miso paste by Samskara Wellness. I’ve been told that they are going to start retailing the paste very soon. Before cooking the clams, discard any damaged ones. 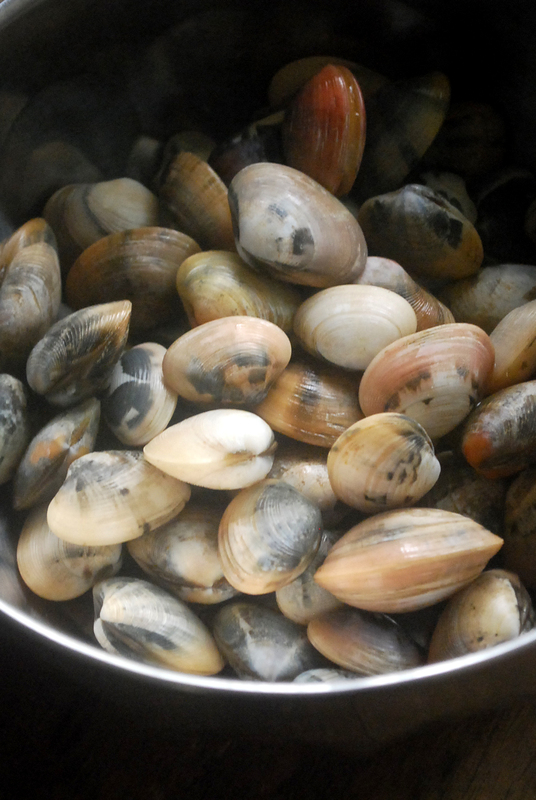 Put the clams in a large bowl, cover with salted water, and let stand for 1 hour. This will help the clams to purge themselves of any sand. Pour the water in a soup pot and add miso paste. Process with a hand held blender until well mixed. Bring the above mixture to a boil. Add clams. Cook for 3 minutes or until the clams are open. Remove from heat and discard any non opened clams. Cut some few pieces of tofu to serve and puree or make a fine paste with the rest of the tofu. Mix the pureed tofu into the hot soup. Check for salt & pepper. Serve immediately in a soup bowl with some cut tofu.